Full-Beam Master Queen + 1 Guest Queen + 1 Twin, each with private bathroom with stall shower. 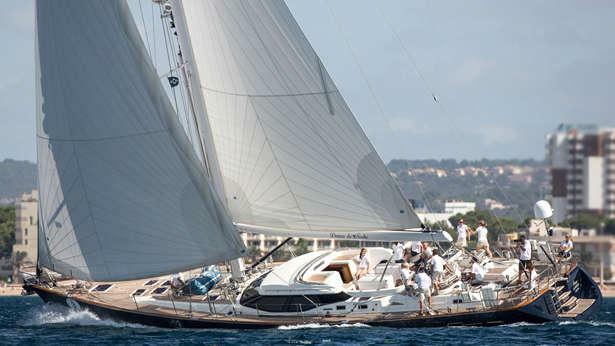 The 82’ Oyster sloop, DAMA DE NOCHE, is the ideal charter yacht. The modern appointments, sailing performance, three crew, and cabinets of fine china ensure guests an elegant, sailing vacation through Southern Italy during Summer 2017 and the Caribbean during Winter 2018. This yacht was one of my favorites at the Antigua charter yacht show in 2015. 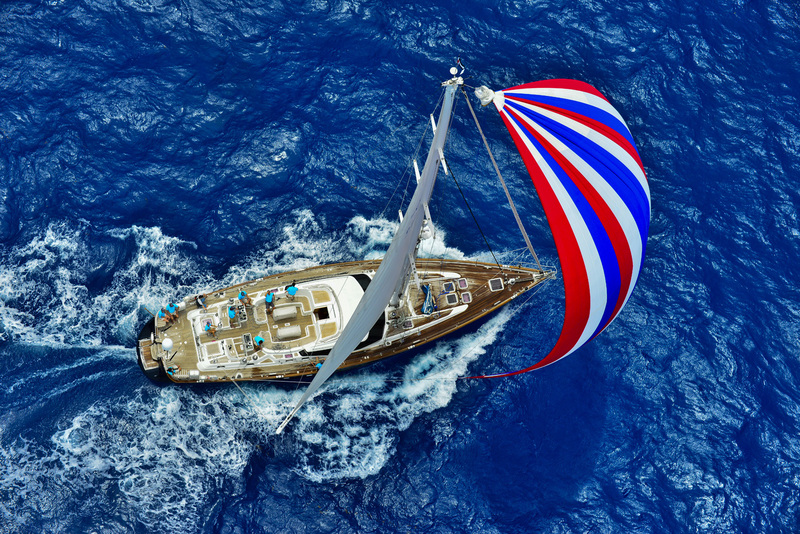 With navy blue hull and teak decks, her cutter rig has push button hydraulics and in-mast furling, which make the yacht easy to sail. 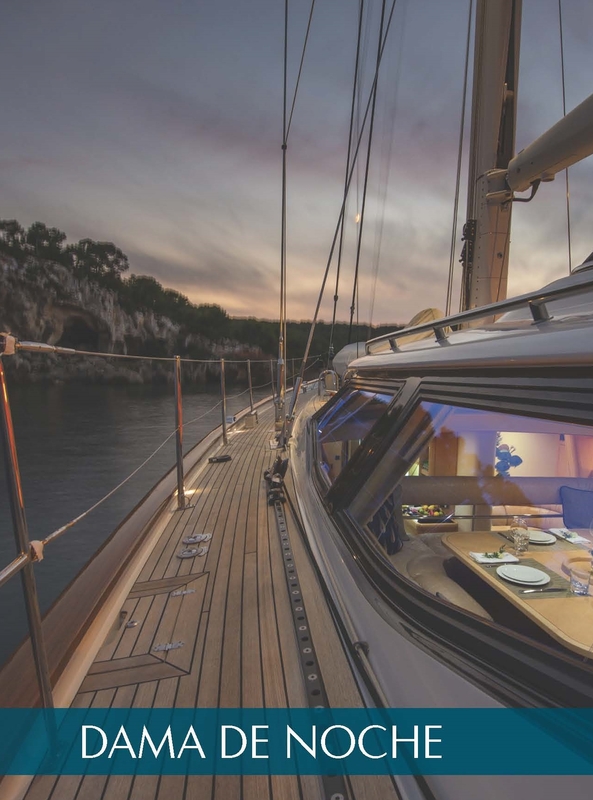 Although the guest cockpit with bimini and dining table is cleared of lines leading in from the sails, guests are welcome to help sail from the sailing cockpit aft. 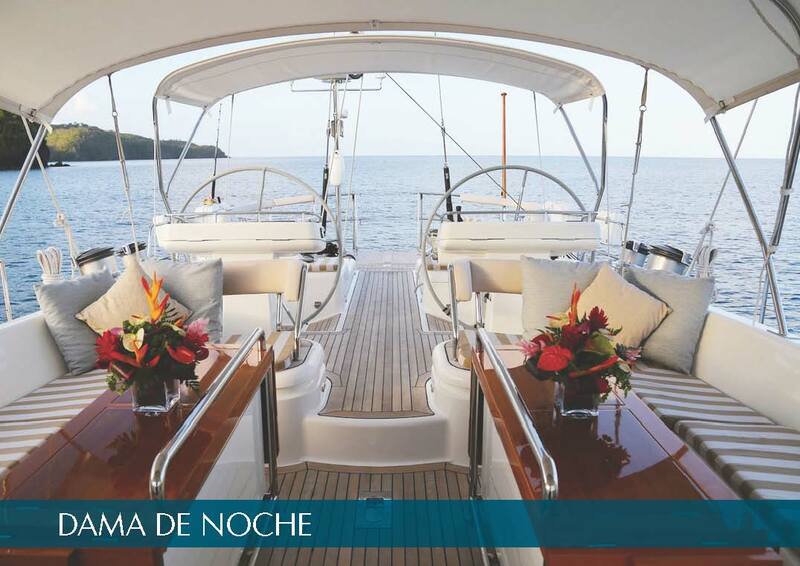 Built in 2008, DAMA DE NOCHE has upper and lower saloons that offer gracious living. 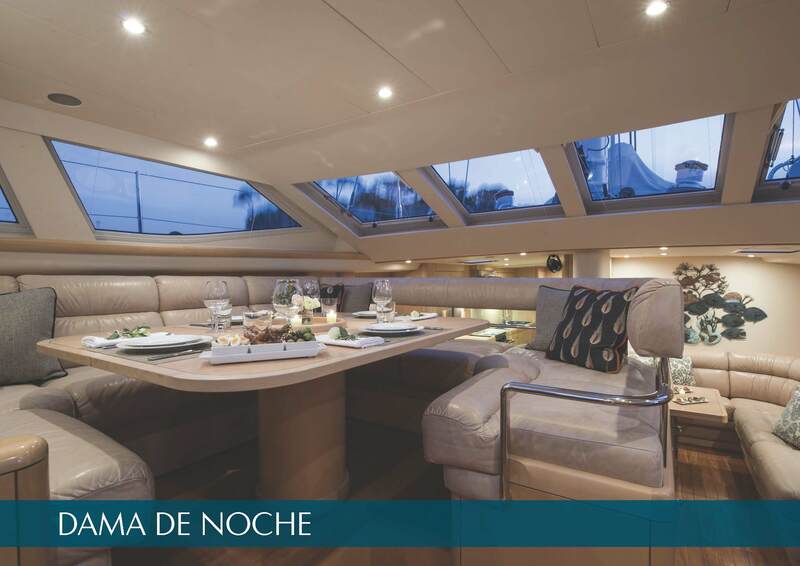 The main saloon with dining table is on the upper level with windows all about, while the lower saloon is more informal, intended for relaxing – or watching movies on the yacht’s Apple TV. The yacht, in fact, has Apple TVs in each of her three guest staterooms, plus library of movies, as well as iPad and iPhone plugs. 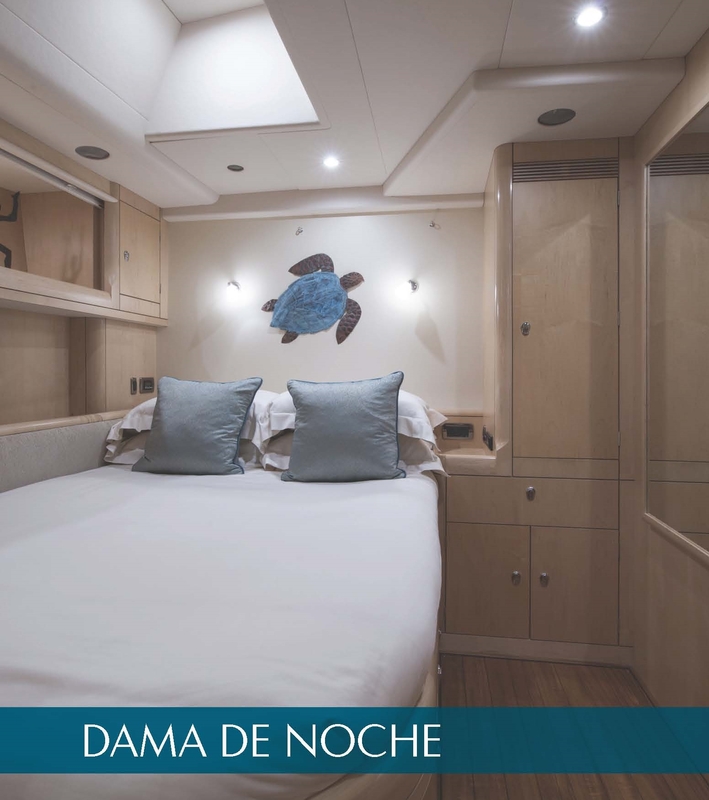 The guest cabins include an enormous master stateroom with centerline Queen, vanity, and private ladder to the deck; two guest, midship cabins each have a double and lower twin berths. All have private bathroom with stall shower. The yacht is fully air conditioned and powered from two generators for the yacht’s modern conveniences like ice maker and hydraulic passerelle or lift that is carried off her reverse-transom hull. 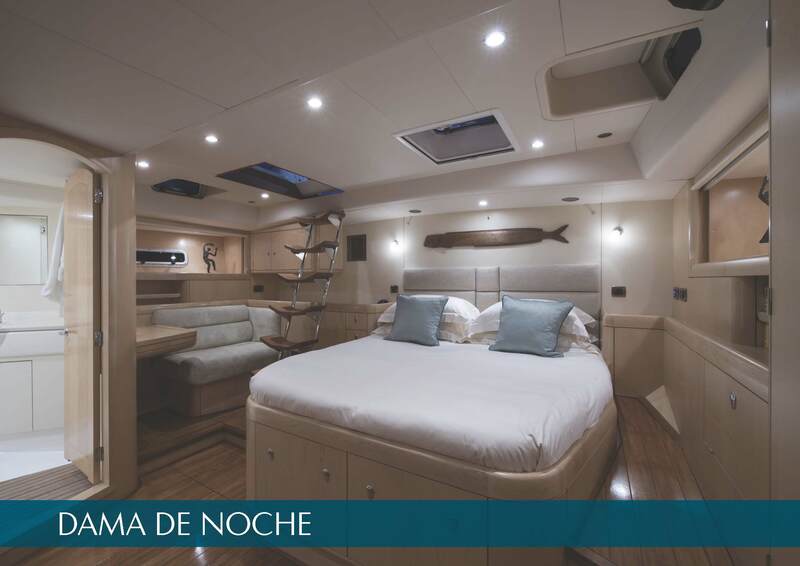 The large galley and crew quarters are forward of the lower saloon, and a spacious galley it is too with lots of storage and counter space on which Chef Marie from Barcelona prepares her delicious meals. Captain Marcelo is from Portugal, and deckhand/stewardess Maira is from Brazil. A crew profile is featured on the link below. 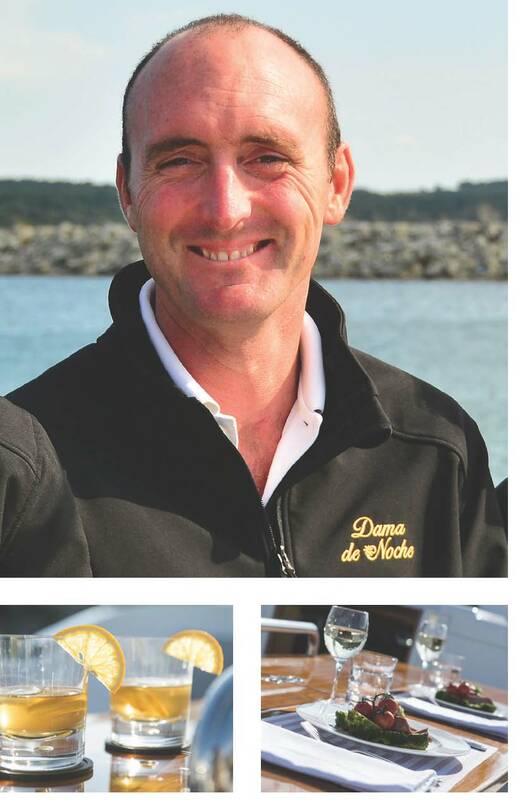 DAMA DE NOCHE will base in Naples, Italy for the Summer of 2017 for cruises through the Aeolian Islands to Sicily. 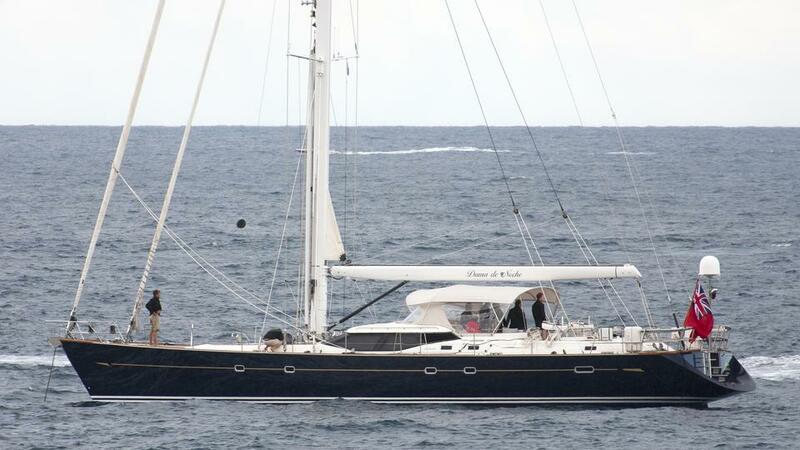 Depending on availability, she might be able to go out to Sardinia and Corsica as well.